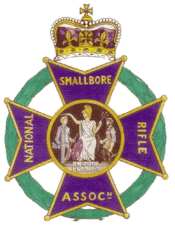 Field Target Air Rifle Shooting is an NSRA-recognised discipline. As such it may be practiced by Scouts on ranges properly constructed to conform to authoritative safety guidelines. 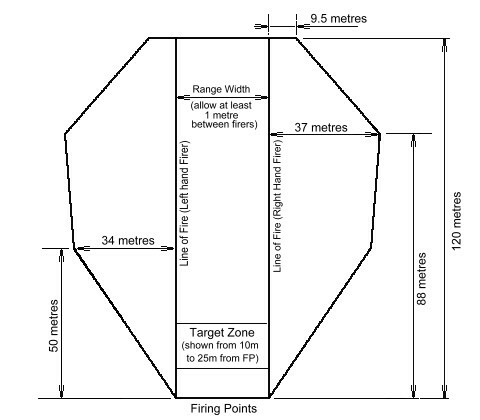 The standard safety template for an outdoor air rifle range is given below. The information is from the NRA reprint of Joint Services publication 403 Vol II (Range Construction) Issued by the Ministry of Defence. Rifles not requiring a Firearm Certificate (muzzle energy < 12 ft lbf or 16.26J). A single firer and a single line of sight. For multiple firers or targets not on a single line the danger area must be increased by superimposing multiple copies of the template. Responsible firers under competent supervision. The last of these is the most important. 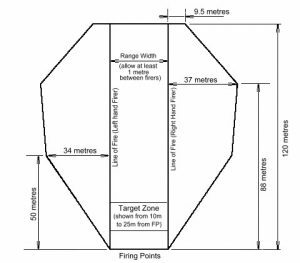 An air rifle pellet fired from a non-FAC air rifle with an elevated muzzle can travel over 300 metres! It is vital that the danger area is under complete control. It must be enclosed with warning signs posted and be an open area wholly visible to the Range Officer so that any incursion may be observed and firing immediately stopped. Ground initially falling and then rising away from the firing point is ideal. Never shoot where you cannot see! 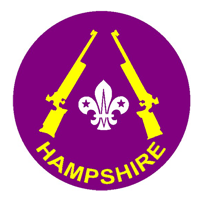 For Target Shooting by Scouts or on Scout premises, targets may not depict human or animal shapes. Suitable targets are available from several sources. One maker local to us in Hampshire who will despatch worldwide, is Knockover Targets.